Greeting listeners! On today’s episode of Dragon’s Demize, Greg and Jakub revisit one of our reviews from waaay back before Greg even joined the podcast. 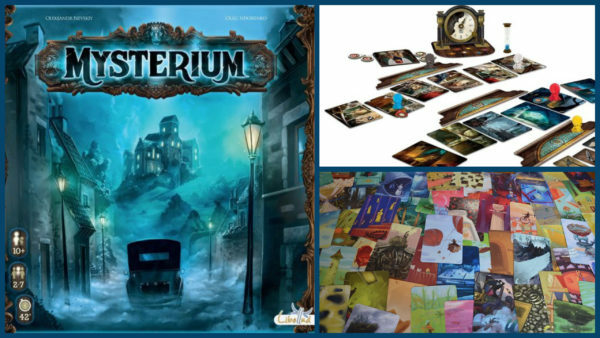 It’s Mysterium! In this cooperative deduction game, one player takes on the role of a ghost who can only communicate with the other players (mediums) via dreams. The other playeres must each identify a person, place, and object before everyone can guess the true identity of the ghost’s killer! Mysterium is definitely a people-pleaser, with its gorgeous but surreal clue cards and emphasis on team cohesion. Check out the review for our full thoughts, especially how the original European version compares to the American version. The games we’ve been playing lately also get their weekly shout-out. We talk about The Pyramid’s Deadline, a tense puzzler from Oink Games, and a new (for us) COIN Series game, Fire in the Lake. Thank you as always to O Abnormal and Agata Poniatowski for the artwork and Strangelette for the music. If you enjoyed this episode and would like to support Dragon’s Demize, please consider joining us on Patreon. You can find content from us on Facebook, Discord, Twitter, and Instagram. Finally, all of our streams, vlogs, and other video content on live on our Youtube channel, or you can catch us live every Wednesday on Twitch.